← CAR ASYST – Display the AdBlue, engine oil and fuel level in lightning speed! 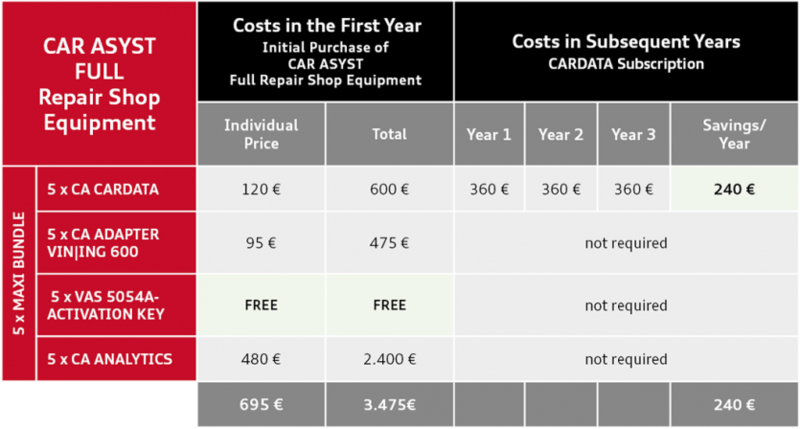 Buy 5 licenses of the CAR ASYST MAXI BUNDLE now and pay for just 3 CARDATA licenses instead of 5 in subsequent years! Opt for CAR ASYST Full Repair Shop Equipment now and benefit from our current discount promotion. You will receive 5 x the VAS 5054 ACTIVATION KEY free of charge and pay for just three instead of five CA CARDATA licenses in the following three years. This means savings of 720 € when using CAR ASYST Full Repair Shop Equipment. Reserve your discounted CAR ASYST Full Repair Shop Equipment now! You will be granted the discount automatically if you renew your 5 CARDATA licenses. You will then only be charged for 3 instead of 5 licenses. Please note: The discount is linked to the use of all MAXI BUNDLE licenses. If one or more licenses are terminated, the remaining licenses can no longer be discounted.